“To get to Prada was a mess. The rain had given us a break, but the traffic was murder. – Il Tutti Blocante, as Milan’s taxi drivers like to say as they chuckle at the mega Euros on the meter. So there I was, dressed in over-the-knee silver mink to protect me from the cold, and they have the courage to call Miuccia Prada a killer… wearing T Shirts! I mean you must be joking! I was only glad, when I came out and it started snowing that I was nice and warm in my mink and ready for what the evening had to offer me. When I finally got inside at Prada, I was offered vodka on the rocks and something to eat. I was unsure about the vodka, because they had an orange drink that looked a lot more fun (which they served as we departed). The interior of the space was dressed as a warehouse, which is high-concept post-modernism at its best, the space itself already being a warehouse. It was a bit like dressing up San Siro stadium as a football ground, but a least I had a great seat and could actually see the clothes, essential in my line of work. Music, lights, and 35 minutes late…la femme fatale a la Prada took her first steps and according to her creator, she wanted the collection to seem affordable, although there was a coat with crocodile sleeves and a fur insert that would have cost me my Italian pension plan. 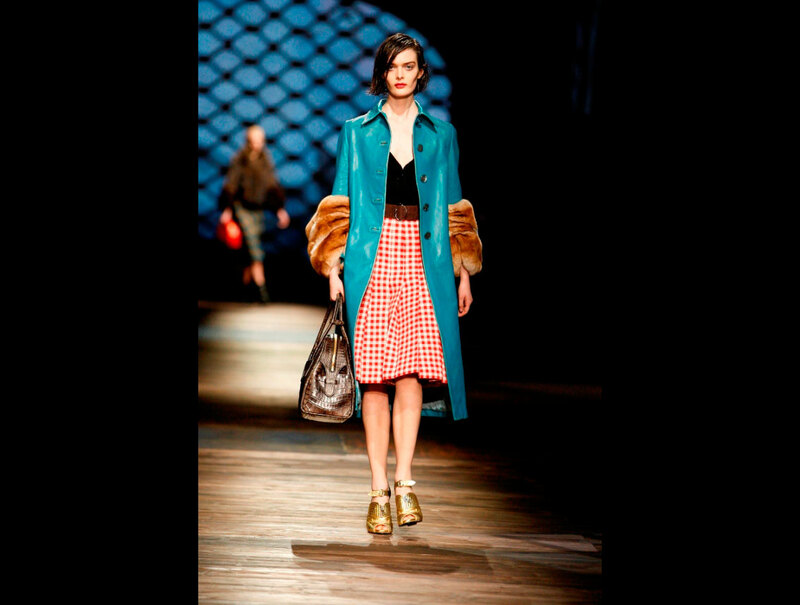 Miuccia Prada, calls her 2013 Fall Winter collection ‘raw-romantic!’ And trust me, it was raw, just the wet hair said it all, but then if you took a closer look it was more than that! It was the raw-mantic woman, but also hard…maybe even angry.